Opening Day! All the excitement of waiting for baseball to return, spring training, the hot stove season...finally, we got down to real baseball. I got home from work and managed to only miss the first inning of this game. For eight innings, it looked like the Red Sox would easily cruise to victory. Chris Sale pitched six strong innings, striking out nine and only giving up one hit. The offense, while not spectacular, managed to put four runs up including two on a wild inside-the-park home run by Eduardo Nunez. Joe Kelly (who I have *not* been a fan of, ever) came in and proceeded to walk batters. And walk some more. As did Carson Smith. There was even a walk with the bases loaded, which is always ugly to see. The coup de grace from Tampa was a bases-clearing triple from Denard Span, and the collapse was complete. The Red Sox middle relief, their absolute biggest weakness the last few seasons, managed to piss a four run lead down their leg and give up six runs to the woeful Rays. And that was the ballgame, a 6-4 Red Sox loss. I've been saying it for years, but Joe Kelly is a thrower, not a pitcher. So he can hit 102 mph on the radar gun...so what? If you've watched him the last couple of seasons, you'll see he has the most hittable 100 mph stuff in the league, which sounds weird but is absolutely true. His control has always been shaky and he just doesn't seem to have the mental makeup to be a good reliever...or even a good pitcher. He's like Wild Thing from the movie Major League, except Wild Thing's control got better when he started wearing glasses whereas Kelly already wears glasses. It's long past due to pull the plug on the Joe Kelly project...it's just not going to work. The biggest bright spot from the game, for me, was Xander Bogaerts starting off strong with two doubles and three hits. He looked very good yesterday...here's hoping he can keep it up for an entire season and not fade down the stretch the way he has the last few seasons (his hand injury last year not withstanding). Anyway, today is a new day and a new game. A loss on Opening Day, especially in the way the Red Sox managed to do it, leaves a bad taste in the mouth, but that's why they play 162 games. Let's see if they can bounce back today. Finally, winter is unofficially over and spring is unofficially here! While I'm not crazy about how much earlier the season is starting this year, it's still good to finally have real baseball back. It's been fun watching spring training games and getting excited for the season, but now the games count. I'll be watching all season to see how the Red Sox do and have contemplated trying to blog every game, all 162 of them. Even if it's only a sentence or two, or if I didn't even watch the game (I tend to watch around 100 a season), I'm mulling over whether to do this by asking myself A) would I have fun doing it and B) would people have fun reading it? I'm still thinking it over and I guess I'd better make my decision soon. What do you think? In the meantime, PLAY BALL! Just like last year, here I write yet another paean to my most beloved of sports as it gets ready to join us in emerging from a long, cold, seemingly never-ending winter. 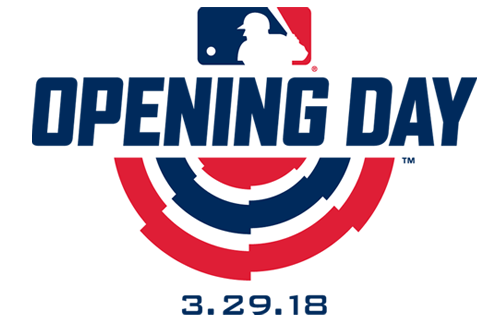 As it does every year, baseball unofficially heralds the beginning of spring and the renewal of both warmer weather and your favorite team's new season. No matter how hopeless or bleak last season was, every spring brings no guarantees, but it does bring something all sports fan hold on to more than perhaps anything else: hope. Just as the newly begun year offers a clean slate, so does the start of a new baseball season. This year, I'm of course looking forward to what my Red Sox do this season, but I'm also excited to watch and coach my kids. This spring I've got two daughters playing softball (one of whom will be playing for the first time) and a son playing baseball. My youngest daughter is playing softball for the first time (she tried tee-ball a couple of years ago) so it will be fun to watch her learn the sport. My oldest daughter is playing on two teams, a travel team and a rec team, and my son is also doing the two team thing (travel and rec). Both of them have been playing a while and put in a lot of extra work outside of practices and games. They're both very good and I'm excited to watch them play and cheer them on (and in the case of my son, I also get to coach him). What about the Red Sox? By most measures they had a successful 2017, winning 93 games and their division in a carbon copy of 2016. However, just like they were in 2016, they were eliminated in the first round of the playoffs, this time in four games to the eventual World Series champion Houston Astros. Last season's team had a huge power vacuum in the first season following David Ortiz' retirement...they were last in the league in home runs and scoring. Several of their excellent young players (Mookie Betts, Jackie Bradley, Xander Bogaerts) also had down seasons. However, Andrew Benintendi in his full rookie season was a revelation on offense and defense, and Rafael Devers showed in a few months that he will be another strong young addition to the lineup in 2018. I'm looking at their young stars to rebound and, combined with the free agent signing of slugger J.D. Martinez, the offense should get back to being close to what it was in 2016. Last season's pitching was surprisingly good overall, even with the regression of 2016 Cy Young winner Rick Porcello and the loss of David Price to injury. Newcomer Chris Sale led the way last year, leading the league in strikeouts and being dominant all season before fading in August and September. I'm looking for the pitching to stay strong, hopefully injury free (looking at you, Drew Pomeranz and David Price), and more consistent (especially the bullpen). In general, though, I'm most looking forward to a better attitude from the players which I believe that will happen since there is a new skipper. Perhaps the biggest change the Red Sox made in the offseason was at manager. They fired John Farrell, who despite "leading" the Sox to victory in the 2013 World Series, was never an inspiring leader or fan favorite. Much of the malaise around the team last season was due to his history of poor in-game management, coddling of the players, and his general unimpressive leadership demeanor in the dugout and off the field. There were also team chemistry issues with many of the players, mainly Dustin Pedroia and especially David Price. New manager Alex Cora was a member of the 2007 champion Red Sox and was a bench coach on last seasons champion Houston Astros. He's young, exciting, and brings a different style of leadership to the Red Sox clubhouse which, after last season, is sorely needed. Here's hoping that the attitude in the dugout and on the field improves and these guys focus more on winning ballgames and having fun, and less on what fans and the media is saying about them. Boston is a notoriously tough market for any athlete in any sport, but since Cora played here, he'll know how to navigate it and keep the team on an even keel. I just have a good feeling about him. Even with the retooled and loaded (at least offensively) Yankees, I'm looking for the Red Sox to be right in the thick of things this season. Spring Training is in full swing and as the weather finally starts to warm up (at least where I'm living now...winter is certainly showing no signs of going away back home in New England) and as Opening Day gets closer, I feel the same way I do every year when baseball is almost back...like a little kid who can't wait for the season to start. I've written of my love for baseball on this site many times. Among all of the sports I'm a fan of, it's my favorite. I played it as a kid all the way through college and I'm now in the position of having children who play it. All four of my kids play (although my second oldest is stopping with this season to focus on other things). In addition to their rec teams, my oldest daughter and my son both play on travel teams, so as you can imagine we've got a LOT of baseball and softball gear in our house and we've gone through a lot of it over the years. Since we're always having to update equipment as the kids grow or things wear out, I thought it would be fun to go through what we're all using for this upcoming season. My thinking is not only would it be fun to talk gear with fellow baseball/softball players and parents, but also to offer some advice on gear that we like in case any of you are looking for something for your own players. Please keep in mind these are just my opinions based on my years of experience playing and coaching, as well as the feedback from my kids who are actually using this stuff..I'm not endorsing anything beyond what I and/or my kids like. My oldest daughter, who is 13, takes her softball seriously and works very hard it...we probably spend on average an extra four hours in the batting cages every week on top of her practices and games. Like me, she's loyal to Louisville Sluggers (I've been swinging their wood bats since I was a kid). This season she got her first composite bat, the Xeno, and the difference in her hitting has been incredible. She's hit for average with a bit of power but since switching to the Xeno, her power has noticeably improved. Quite simply, the pop this bat has is amazing...the ball literally flies off of it when she hits it and she won't use any other bat now. She's swinging the 32"/22 oz model and she absolutely loves the bat. It also has completely eliminated the vibrations when she hits a ball toward the end of the barrel. 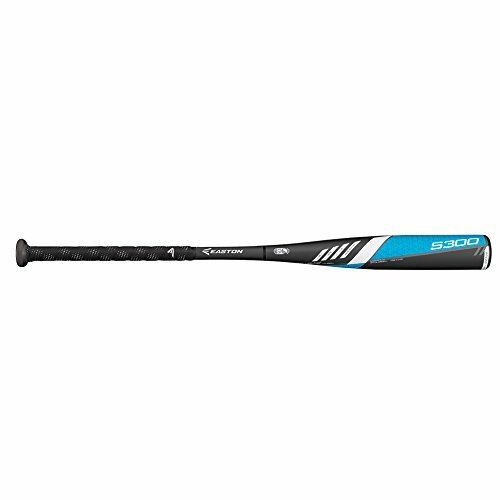 This is one bat I highly recommend for any serious fast pitch softball player who, like my daughter, hits for average and power. If you hit solidly for both, this is the bat for you. I bought this bat for my son this past summer when he needed a new bat to replace one he'd outgrown. The price was right and this bat has a ton of pop. He used it this past fall and did really well with it, but I bought it right before the new USA Baseball bat standards were released so he won't be able to use it in the upcoming Little League season. However, he's going to be using it for his travel season since they aren't beholden to the bat standards. It's a good thing because even though his new bat for Little League (see below) is basically the updated version of the S300, it is much deader and doesn't have nearly as much pop. 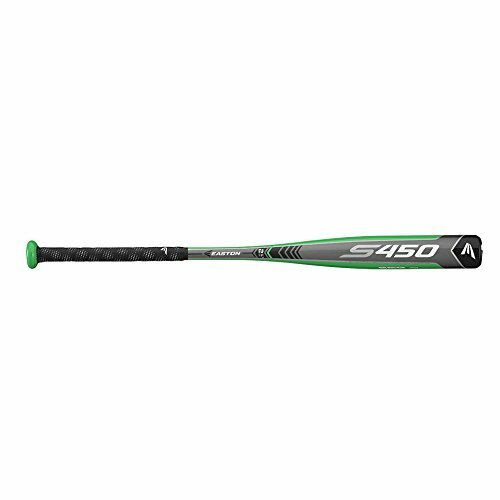 If you're looking for a great youth bat and don't need to adhere to the new USA Baseball standard, I highly recommend this one. Starting in 2018, Little League has changed the bat standards such that all bats approved for use have to adhere to the new USA Baseball standards. Having just bought my son, who is 8, a new bat over the past summer (see above), we were now faced with the fact that his bat, while still legal for his travel team, would not be allowed in the upcoming Little League season. Needing a new bat, we turned to the USA Baseball version of his previous Easton bat. My wife and I didn't want to break the bank so we went with this relatively inexpensive bat. My son really likes the way it feels, although both of us are a little bummed at the reduced pop it has. However, this is by design as the new bat standards were put into place so that manufacturers had to make the bats hit a bit more like wooden bats. As a wood bat purist myself, I like this although they've deadened the bat enough that it's a little sad. Still, he hits the ball really well with this and has been using it almost non-stop over the last month. It's a testament to how good his hitting is that there hasn't been much of a drop off. For the price, it's a quality bat and we've never had anything but good luck with Easton bats. My youngest daughter is 7 and will be playing softball for the first time this spring. Having seen her two older sisters play for the last several years, she's dying to get out on the field and start playing herself. 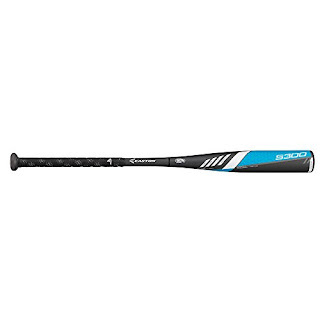 Since this will be her first time, we went with this Easton fastpitch bat that had great reviews on Amazon. So far, she's done really well with it and it learning how to hit properly. The bat is light enough for her to swing it and when she makes contact, she hits it pretty hard. It's been a great starter bat for her. My oldest daughter had worn out the pair of Mizuno Jennie Finch batting gloves she'd had since 2016 and wanted another pair. However, they didn't make them the same way they used to and there were some bad reviews in terms of their durability, so we needed to find something else for her. We got her these Lousiville Slugger Xeno gloves for Christmas and she absolutely loves them. They've got a bit of padding but not too much that she can't get a good grip on the bat. The patterned palms and fingers are textured and help with the grip and the gloves are very comfortable, flexible, and breathable. We were also able to get them in purple and grey so that they'd match her team colors. Hers are starting to wear just a little bit in the palms but she's used them almost every day since getting them at Christmas and it's very minor. For the price and quality, we've been very happy with them. My son wore his previous pair of Franklin batting gloves out to the point that there were holes and tears everywhere. He needed a new pair but also wanted some that would match his team colors of purple and black and he's also crazy about anything Under Armour. After a little bit of looking around, I found these Clean Up batting gloves that come in a variety of colors, including purple and black. The first thing he noticed about them was how great they look (they really do!). He also says they're really comfortable and give him a good grip on the bat. Just from touching them, I can tell that they're really very well made. My son and I are both very happy with these...how often does that happen? 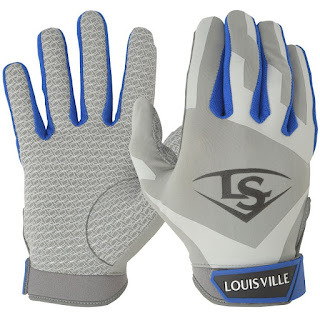 I highly recommend these gloves. My oldest daughter is primarily a shortstop and third baseman. She had a nice Rawlings glove that she'd been using the last couple of years, but she outgrew it and it was also starting to tear near the opening. 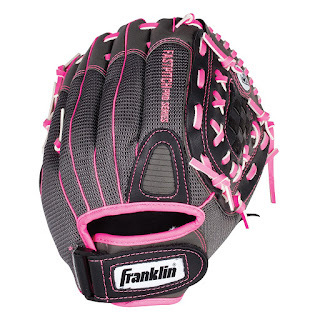 We went glove shopping and as soon as she put on this Mizuno MVP Prime model, she fell in love with it. The leather was really sturdy but soft and it took her no time to break it in. She says it's really comfortable and so far, it's held up great through a fall rec season and fall travel season. 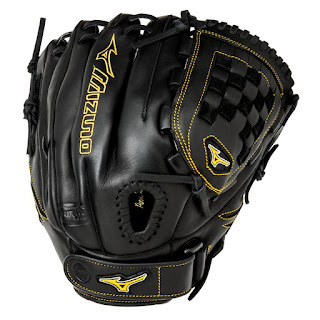 Mizuno typically makes really good fastpitch softball gloves and we're both very happy with this glove. My son was in the same boat as my oldest daughter when the previous fall season had just started: his glove was wearing out and he'd outgrown it. 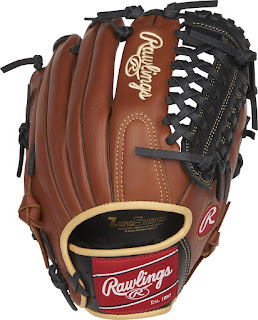 Being a faithful Rawlings user going back to my own childhood, we went looking for a new glove for him and ended up with this one. It was a bit stiff at first and has required a fair amount of breaking in, but he loves it and says it's really comfortable. He also says that the palm has a bit more padding than his old glove so that he barely feels the ball when he catches it. He's happy, I'm happy, and I've turned him into a Rawlings guy just like his dad. As I stated above, my youngest is going to start playing softball this spring. Her only previous experience is a season of tee ball she played two years ago and the glove she used for that is much too small now. Add in the fact that she's left handed and finding a quality glove for her is doubly challenging. Luckily, my wife did some research and found the Franklin Windmill glove. It was inexpensive, nicely built, and very easy to break in...and they also make a left handed model! 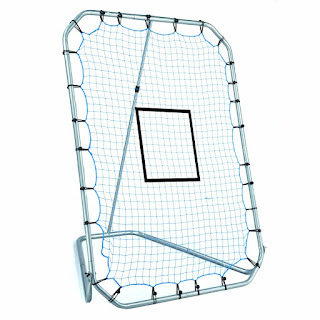 Just playing catch with my daughter, she really likes this and I expect it to its job well this upcoming season. 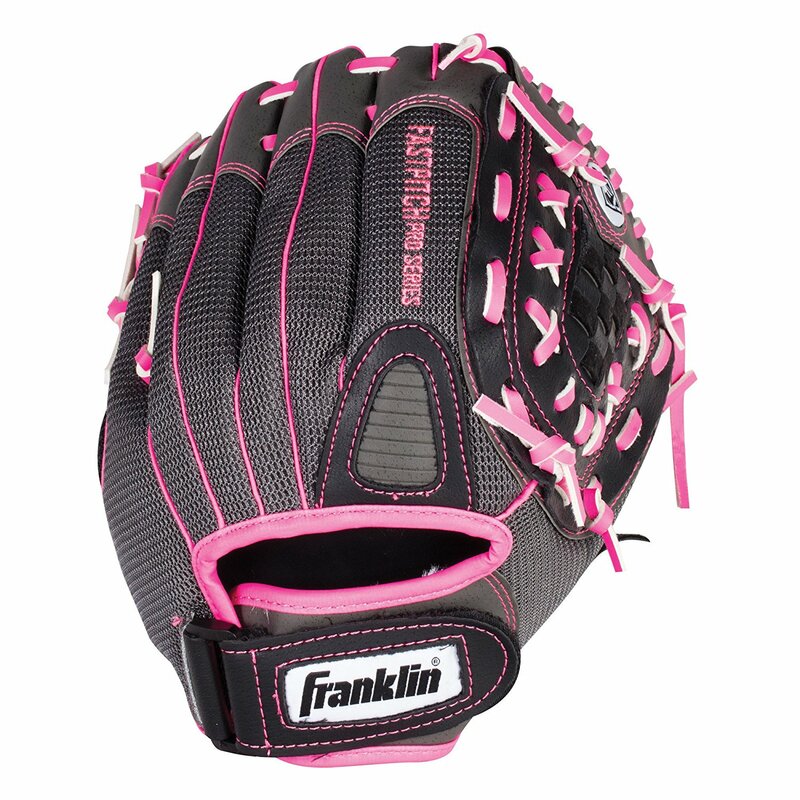 I recommend this as a nice starter glove for any girl starting to play softball. My daughter was looking for a mid-top cleat for a bit more ankle support, but she didn't like the look or feel of any of the women's softball cleats. She tried on these Nikes (which are men's cleats) and loved them. They give her a lot of ankle support but are light enough to not compromise her speed (and she is a FAST runner). Also, the spikes on the bottom are made out of hard molded plastic so they grip really well. I've been a Nike guy my whole life, from basketball shoes to baseball cleats, running shoes, and everyday sneakers. Up to now, my daughter had favored Under Armour but I think these Huaraches have changed her mind a little. 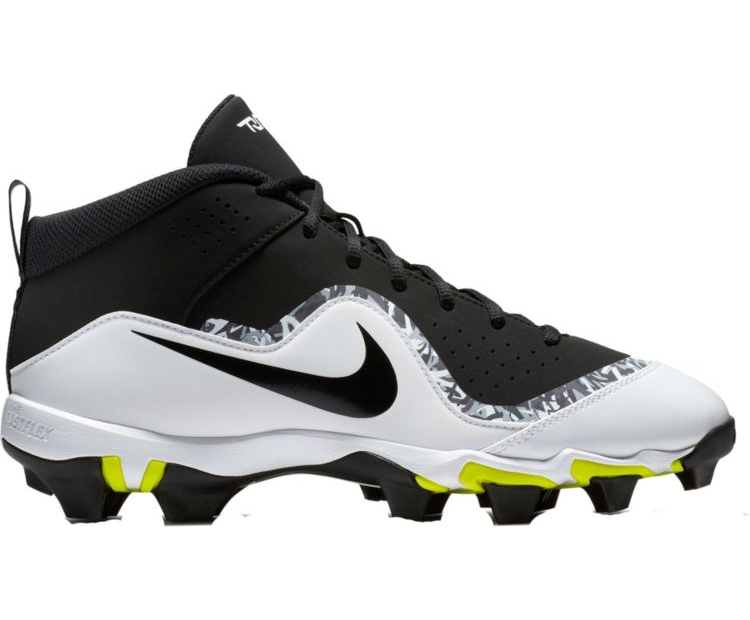 Mike Trout is my son's and my favorite non-Red Sox player, so when he found out Nike made a Trout signature cleat, he wanted to try them out. Luckily, they didn't just look great and have Trout's name on them...they were really comfortable. 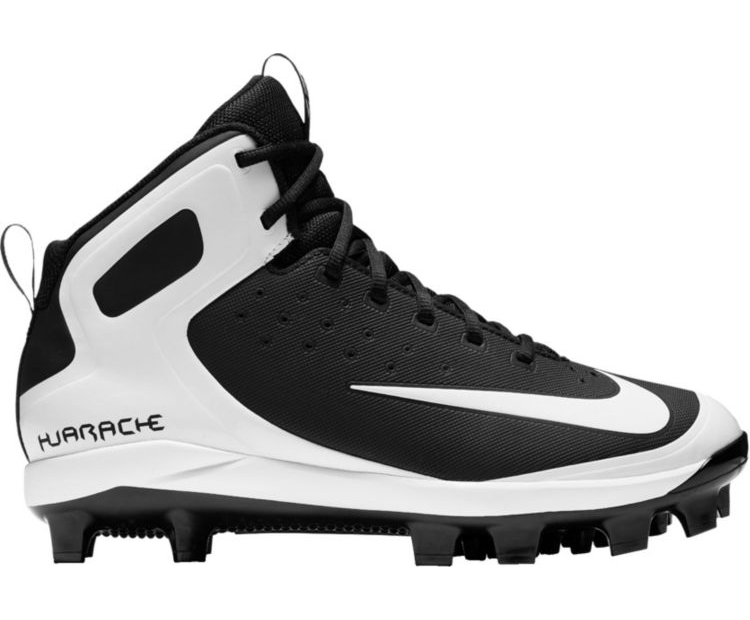 He also wanted a mid-top cleat for some extra ankle support (plus that seems to be the fashion lately), so the Trouts fit the bill. He seems to really like them...as soon as we got home from the store, he put them on and ran out into the yard to practice with our return trainer! You'll also sometimes see this referred to as a "Jeter ball" since Derek Jeter endorses it. I first encountered this strange looking ball when I took my son to a baseball clinic at a local university a couple of months ago. 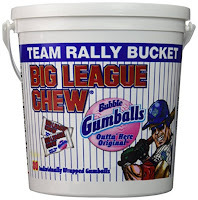 They had a whole bucket of these and one of the drills involved rolling grounders to the boys for them to field. 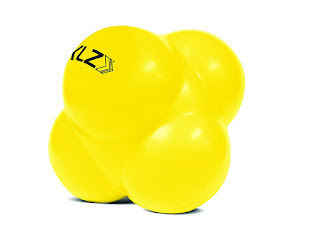 Because of the irregular shape, the balls take all sorts of crazy hops and bounces. This helps with training reflexes and especially with fielding short hops. Since my oldest daughter is primarily a shortstop/third baseman and my son is primarily a second baseman/shortstop, I thought something like this would be fantastic. After finding out what it was, I ordered one for myself and I'm not sure who was more excited to use it: me or my kids! We use this as part of our infield practice when I run them through drills and besides being a lot of fun, it's great to build the reflexes up for when hard hit balls take strange hops. 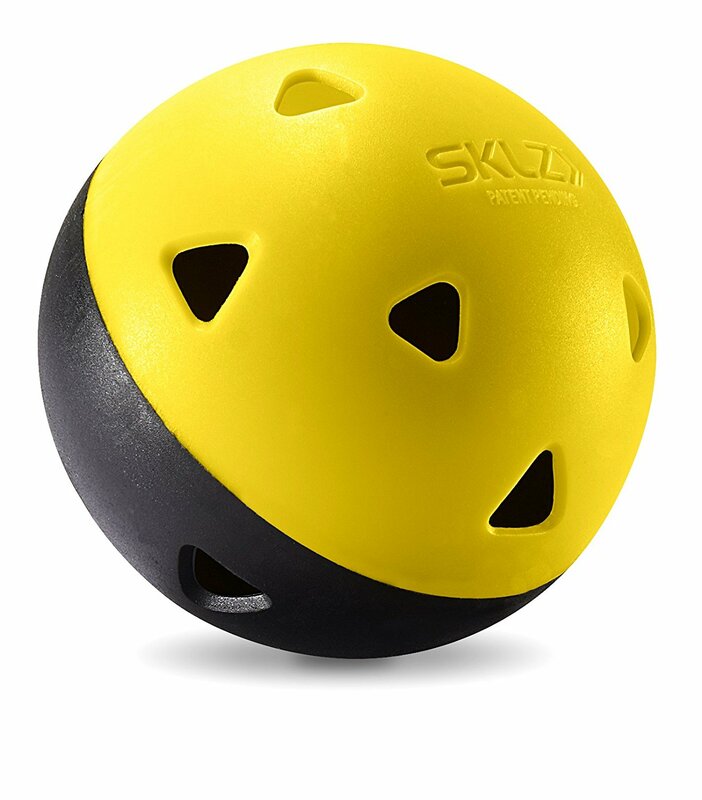 If you've got a player who is an infielder in particular, or just want to improve your ground ball fielding skills, I highly recommend this ball. My wife and I bought these for our son for Christmas and while we haven't used them a lot (yet) since we've been limited to indoor batting cages, the few times I've pitched them to my son he's really liked them. 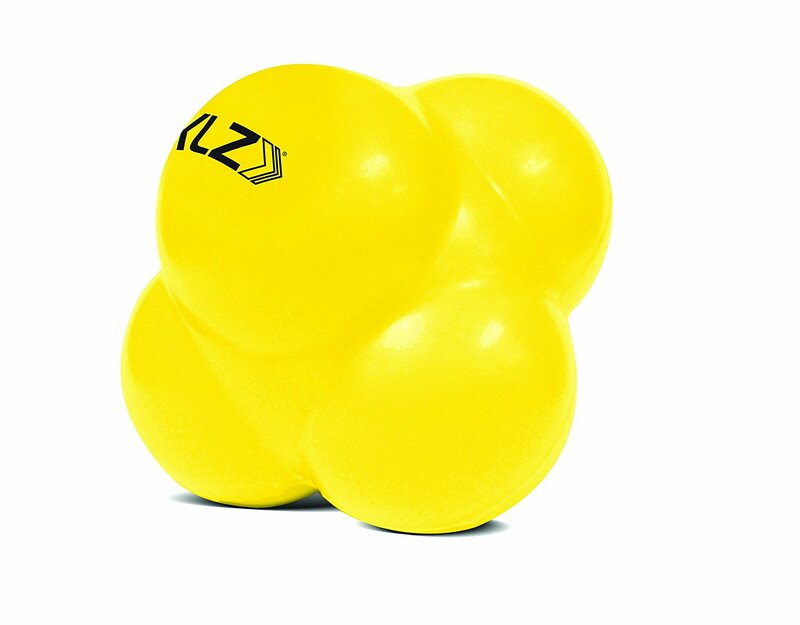 The balls are the size of a golf ball and made up of half rigid plastic (the yellow half) and half softer black rubber (the black half). 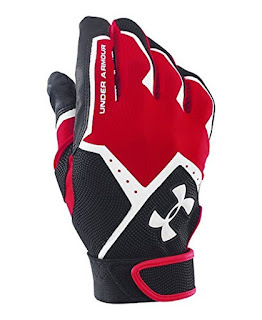 They're really good for working on hand eye coordination when hitting because of their small size and the two-part construction makes them durable. Also, these don't fly that far once they're hit which is nice because it allows you to see where your batter is making contact with their swing (and it makes picking them all up after easier since you aren't having to chase them down everywhere!). These are fun to use and I know we'll be using them more once we can move to practicing outside. 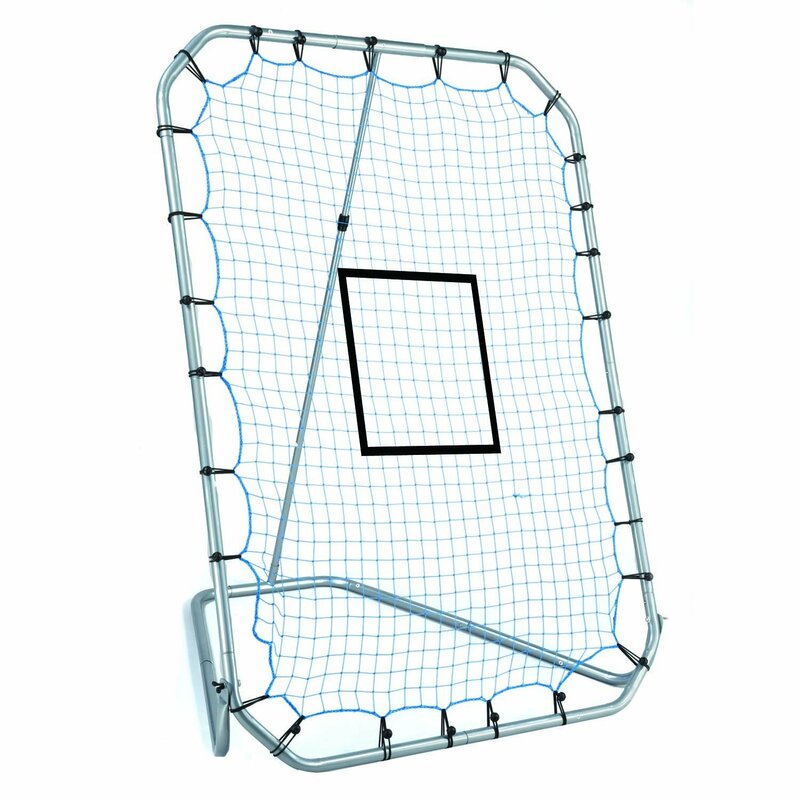 If there's one thing we've bought for the kids that we've definitely gotten our money's worth from, it's this return trainer/rebounder. We bought it a couple of years ago and it's gotten so much use from all of the kids (and me!) that it's paid for itself many times over. We mostly practice fly balls and grounders with it, but my son also practices pitching with it. The angle of the net can be adjusted to adjust the trajectory of the ball coming back at you, and the speed at which you throw at it determines how far back it will bounce. It's especially good because it can be used individually or in a group. This isn't a new piece of equipment for our family, but it's one that we use constantly and which I would definitely recommend to anyone who wants to get more practice in. After using a variety of bags the last few seasons, all of my kids have realized that with gloves, helmets, bats, cleats, facemasks (for softball), and the rest of their stuff, they run out of space pretty quickly. 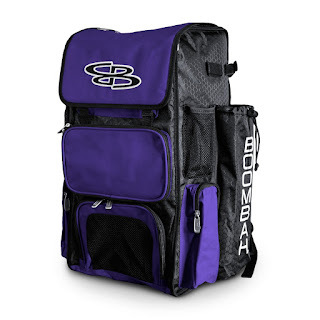 For the travel teams they're now on, my oldest daughter and son got team bags and luckily both teams went with the BoomBah Super Pack. They were able to get them in their team colors (but a variety of colors are available) and so far they've worked out great. 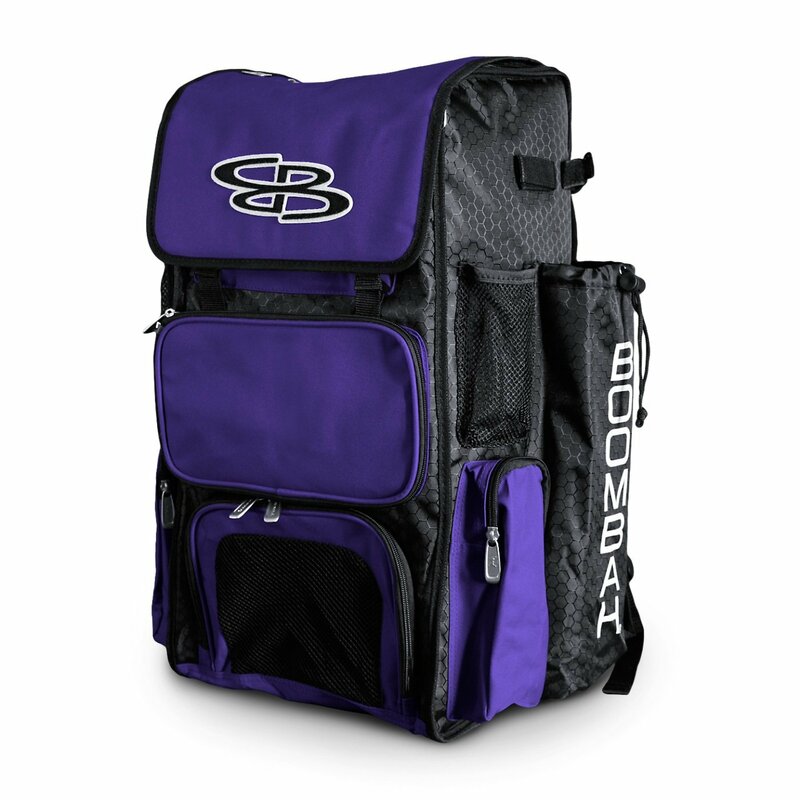 There's plenty of room for all of their gear in the top compartment, there's a reinforced bottom compartment for their cleats and shoes, room to hold four bats, and lots of other smaller pockets and pouches. In addition, the front middle panel is removable and can be embroidered with team logos and player names and numbers. All in all, we're very happy with this bag. Who doesn't like wearing eye black? I always loved wearing it as a kid and even in college...while the jury is still out as to whether it really helps keep the sun out of your eyes, it's fun to wear and looks really cool. Over the last couple of years we've found iSplack and we really like it. 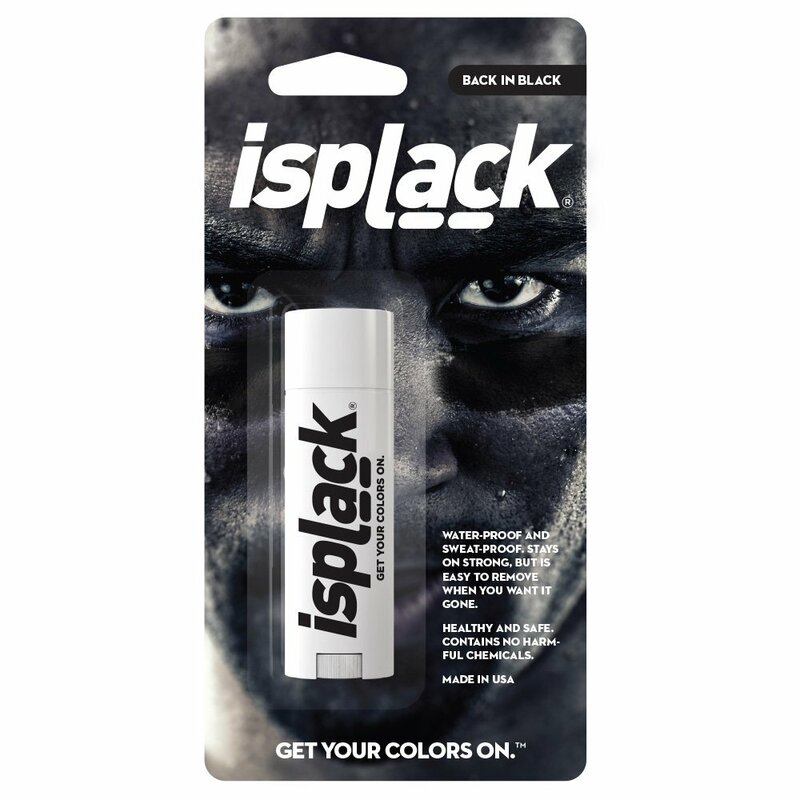 It comes in a ton of different colors, is easy to apply, stays on regardless of how much you sweat, and is easy to remove without any skin staining. It's just something fun the kids like to wear for their games so they've each got a stick or two in their bags. 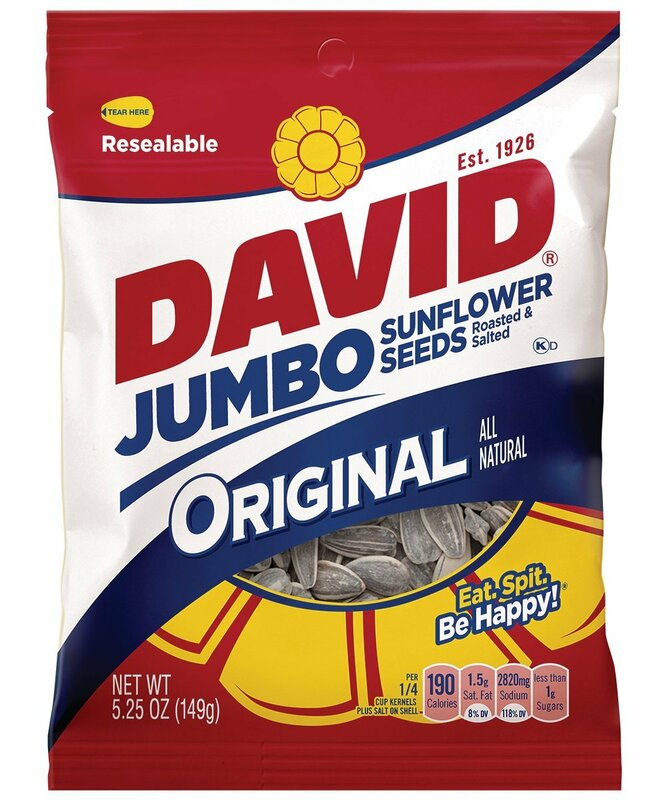 These sunflower seeds are one of our favorite snacks, and not just for baseball and softball. 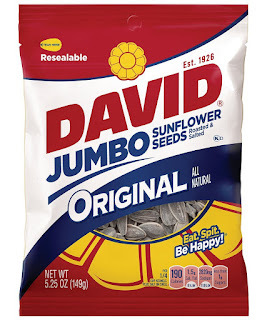 The kids and I usually have a cheek full of seeds during games, when I'm practicing with my kids out in the yard, or even when I'm just outside doing other things like cutting the grass or yard work. Because who doesn't like salty snacks and spitting out shells? 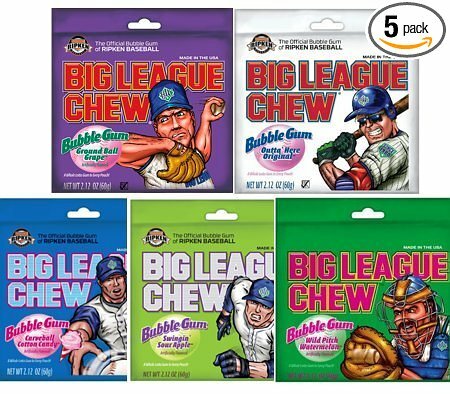 You can't have baseball or softball without gum, right? I used to love Big League Chew as a kid and now my kids love it. I do have to admit that the concept (shredded gum in a pouch to mimic chewing tobacco) is admirable in promoting a healthy alternative to chew, I'm not sure kids today understand it the way we did thirty years ago. Still, they have fun chewing it (and I still do, too!). When I was a kid the only flavors were original and grape, but now they have three more flavors: watermelon, green apple, and cotton candy. We like them all except for the cotton candy. 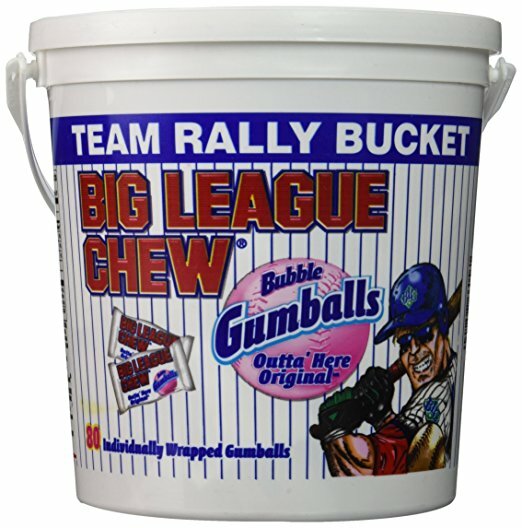 We go through a lot of pouches of this stuff, and we also like the bucket with the individually wrapped round/baseball shaped gumballs. That wraps up my gear review for 2018. My intention all along was to share information and advice on the gear we like that's worked for us over the previous fall season as we head into the spring and summer seasons. I hope this has helped anyone who's been looking for any new gear and has been fun. Sometimes I just like talking baseball and softball gear and I know lots of other coaches, players, and fans out there do as well. I'd love to discuss with you further in the comments below and if you have any suggestions or gear you'd like to talk to me about, that's even better! In closing, for anyone who is getting ready for the upcoming season, good luck! Have fun! And last but not least...play ball!